Reprinted with kind permission from The Beaver, June 1933. Not long ago I traversed  not in the accepted fashion, but on foot  one of the most interesting tramways in Western Canada. I have travelled on several types of railways, varying from narrow gauge ones in Alberta coal mines, where the cars are hauled on the upper levels by small, compact locomotives and on the lower ones by ponies, to the subways of New York. But the Grand Rapids tramway is, to my mind, more suggestive of romance and the usages of days now past than any other. The track was originally laid in the days of canoe and York boat transportation, and the mode of transport was by horse-drawn flat cars. It was found necessary to build such a road for the purpose of overcoming a seven-mile portage to avoid a very rough and dangerous stretch of rapids at that point on the Saskatchewan river just prior to where it enters Lake Winnipeg. The rapids are not quite in a direct line, as one would expect, but form the shape of a very shallow crescent; so that the road, which was cut through the bush from one end of the rapids to the other, is practically straight and slightly shorter than the water route. At the time of building, all the freight for the western districts coming from England was transported as far as York Factory by the Hudson's Bay Company's vessels, from York Factory to Oxford House by York boat freight, and thence by canoe and York boat via Norway House, Grand Rapids, and so up the Saskatchewan River to the western districts. 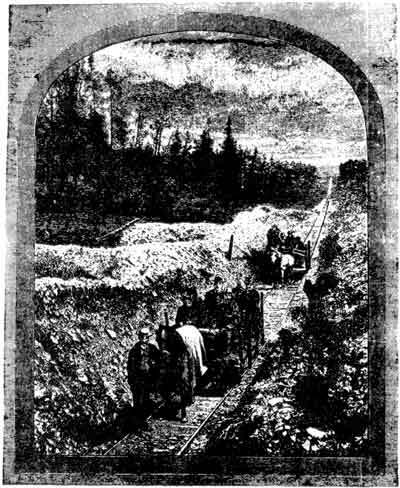 Fifty-five tons of iron were used in the construction of the track, and the rails were brought in from the United States to Winnipeg by steamer in 1877 and reforwarded to Grand Rapids by the Hudson's Bay Company steamer Colville. Walter Moberly, of the C.P.R., was in charge of the construction. We became acquainted with the Grand Rapids tramway in this wise: On the arrival of the steamer on which we were travelling at Grand Rapids, the captain told us that, as the boat would be staying at Grand Rapids for the afternoon, a good way for us to spend the time would be to run the rapids in canoes. Now, there are captains and captains; and as this was my first encounter with ships and tall stories, I believed him. We all did. His directions were most explicit. We were to go to a point indicated on the bank of the river, where we would find Indians waiting, with horses and flat cars, who would see that we had a comfy ride to the far end of the tramway, were safely stowed in canoes, with competent guides who would take us through the rapids, and so back to the steamer. The Tramway in use in the 1880s. We left the steamer shortly after lunch, and finding no Indians or horses by the flat cars, which were looking rather dejected, forlorn and moss grown, and thoroughly incapable of motion, decided to walk to the far end of the track and canoe down the rapids anyway. So off we went  four missionaries, a medical student, one nurse-to-be, and the writer. Kind friends on the boat had urged the necessity of heavy coats to avoid getting soaked in the rapid-running process. We had heeded, and were loaded down with trench coats. The first few miles were quite uneventful. Heavy timber closed us in on each side, and gay little flowers peered out from between the rotting ties on which the track was laid and from the edge of the solid green wall which closed us in, right and left. The country rose steadily in long undulating ridges. Every time we topped a rise it was only to see another and higher one beckoning us on. And then the nurse-to-be lost the heel of her shoe. Now, losing a heel may not seem a tragedy to a man, but to a woman (especially when it is a French heel) well! We stopped, and the heel was hammered on, and re-hammered on at intervals of approximately every hundred yards. The business of topping ridges was getting a little monotonous; so we struck off along a little track to the left in hope of finding a shorter route to the rapids, but only found a native lime-kiln at the end of it. However, still with the spirit of explorers, we kept on through the bush. The going was getting more intricate every step, over fallen trees, under flopping branches, twigs in our hair, and our stockings in shreds; and all this under a burning sun. We resought the track. At last, having hopped, skipped and jumped over rotted and rotting ties for some five miles in all, we arrived at the north end of the rapids, to the accompaniment of thunder and black clouds which had been in the offing all afternoon. But -- No Indians were there; only two little Indian boys, offensively good natured, who grinningly assured us, "No men here. All gone. Canoe gone too." So. facing south, we retraced our aching way. 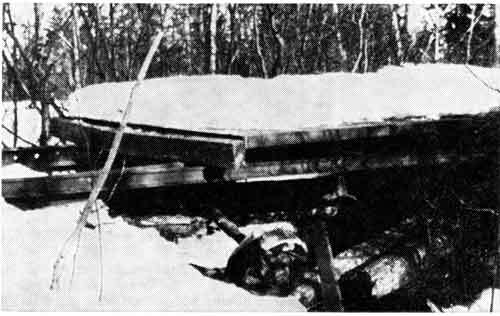 Remains of an old tramcar, Grand Rapids, Manitoba. Hop, skip and jump over the ties  heel lost again! Thunder rumbling in the north, and black clouds gathering. I thought, unenvyingly, of the many voyageurs who had packed loads over that very portage under much more trying circumstances, and liked it. Frankly, I didn't. An underfed husky, black as sin, with a chain dangling several feet from his collar (by which he had evidently been secured, but had broken) joined our party and lolloped along quite companionably, making playful grabs at swinging hands and skirts, and adding a note of uneasiness to the feminine portion of the party. And so to the steamer, where, with no longing looks at the green shores of Grand Rapids, we faced the mirth of our fellow passengers. But, I ask you, how many of you can boast of having walked the full length of any tramway and back in one summer afternoon, to the hazardous accompaniment of mosquitoes, black flies, thunder and broken heels?